It’s fish season at Arby’s, and that means wild-caught Alaskan pollock breaded and fried to perfection then served in sandwiches and flatbreads through early April. Never satisfied with the status quo, Arby’s has turned to a culinary spice trend to give guests a hot take on a familiar favorite. Nashville Hot Fish is Arby’s twist on the Nashville hot chicken craze. 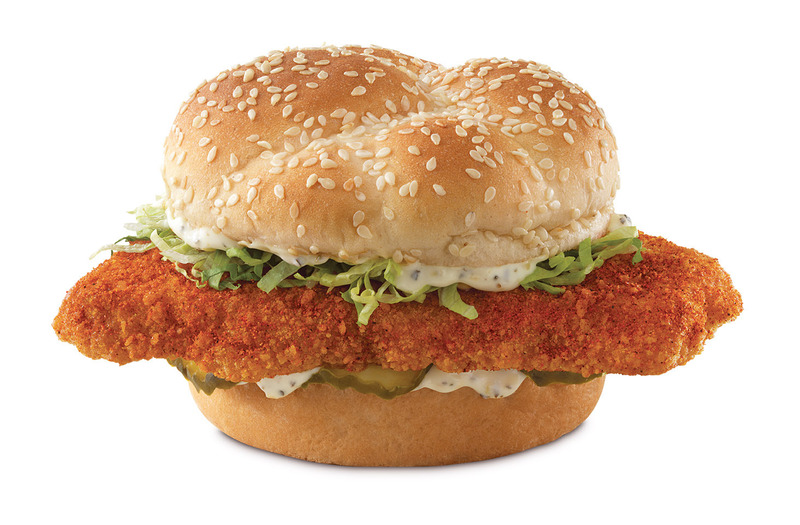 The wild-caught Alaskan pollock fillet is fried and then coated with a spice blend of cayenne pepper, paprika, salt and garlic powder, then topped with dill pickles, shredded lettuce and Parmesan Peppercorn Ranch on a sesame seed bun. Arby’s Nashville Hot Fish fillet is also available wrapped in a warm flatbread, or as the King’s Hawaiian Nashville Hot Fish Deluxe with cheddar, dill pickle, tomato and shredded lettuce on a sweet King’s Hawaiian® bun. In addition to Nashville Hot Fish, Arby’s popular fish lineup remains intact, including the Crispy Fish, Crispy Fish Flatbread and King’s Hawaiian Fish Deluxe. Guests can now enjoy any two Arby’s fish sandwiches for only $5. In a large Dutch oven or cast iron pan, preheat about 2 inches of vegetable oil to 360 degrees. Whisk the cornmeal, a 1/2 cup of all-purpose flour, cornstarch, onion powder, mustard powder, cayenne pepper, salt and pepper. Slowly whisk in seltzer until combined. In a large shallow baking dish, add the remaining 1/2 cup of all-purpose flour. Season the fish fillets with salt and pepper on both sides. Dredge the fish in the flour, coating both sides of the fillet, then dredge in the cornmeal batter and gently place into the preheated oil. Fry until fish is cooked through and golden brown, about 4-5 minutes on each side. Remove to a paper towel-lined plate and allow to cool slightly. Repeat with remaining fish fillets.